Чипы: синие(вправо/special), зеленые(влево), ореховые(прямо/special), светло-зеленые(прямо/special). Макияж: тени цвета зеленого чая, розовые румяна и цвет губ. Особенности: совместный выпуск с Mamechiyo*. Ногти светло-розового цвета. Аутфит: кимоно, оби, 2 пары носков, 2 пары гэта, шляпка, зонтик, шаль, перчатки, нижнее белье. Millefeuille - это сорт пирожного, популярного в Японии, слово традиционно коверкают до "миру-фиру"
The latest Blythe "Strawberry Millefeuille" is designed by Mamechiyo, the popular modern Kimono artist. "Strawberry Millefeuille" was inspired by cute, candy-like yukata kimonos. "Strawberry Millefeuille" wears a pink kimono embroidered with brown roses and small flowers, this is accented with the lattice pattern embroidery on the hem of the kimono. Her brown obi belt is embellished with feminine touches of lace and ribbon. The set comes with two pairs of Geta (Japanese traditional sandals). This attractive ensemble will make for an exciting and beautiful Blythe photo session, she is more photogenic than ever! The set also comes with a parasol, a sun hat, lace stole, lace gloves, tabi socks, and many more cute accessories! She is perfect for a summer picnic! This set can be arranged into a variety of romantic looks! 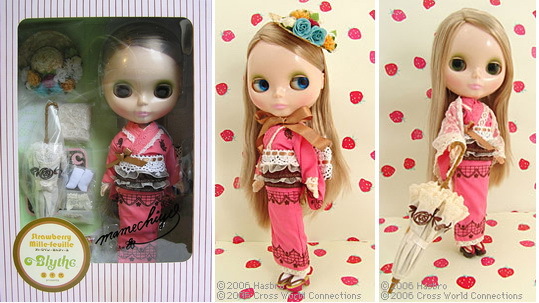 The doll has pale white skin with green tea colored eye shadow with blushing lips and cheeks. She is also wearing light sakura pink nail polish. She has deep blue eyes looking right, stock green looking left, matcha tea green eyes and earthy brown eyes facing frontwards. Her gentle ash blond hair perfectly matches her fair, white skin as requested by Mamechiyo.